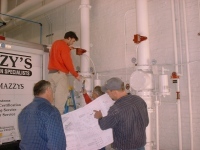 NFPA 13, Standard for the Installation of Sprinkler Systems, NFPA 25, Standard for the Inspection, Testing, and Maintenance of Water-Based Fire Protection Systems, and California Health and Safety Code Title 19 specify requirements for fire sprinkler and standpipe installation, inspection, testing and maintenance. Fire sprinkler testing must occur quarterly, annually and every 5 years. Standpipe systems (water pipes which are connected with the water supply of the building and are designed to flow water to the fire hoses of a building at all the different floor levels) must be inspected and/or serviced bi-annually, annually, and every 5 years. As a note to building owners...in the event of a fire one of the first things that an insurance company, or hostile litigator will subpoena, is all of the records which show proof that the fire sprinkler and standpipe systems have been professionally maintained by a licensed fire protection engineering contractor. Having proper fire sprinkler certification performed by a licensed California contractor can save you from getting caught up in civil, criminal or insurance problems. Have the 5 year test of your automatic fire sprinkler system done today.